Thank you, Modern Table for sponsoring this post. 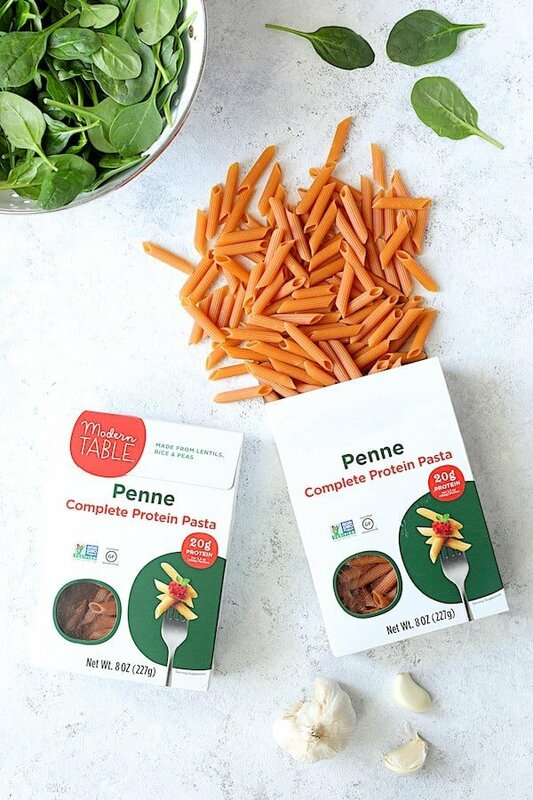 This delicious, complete protein pasta is made from just three plant-based ingredients — Eat clean with Modern Table pasta today! 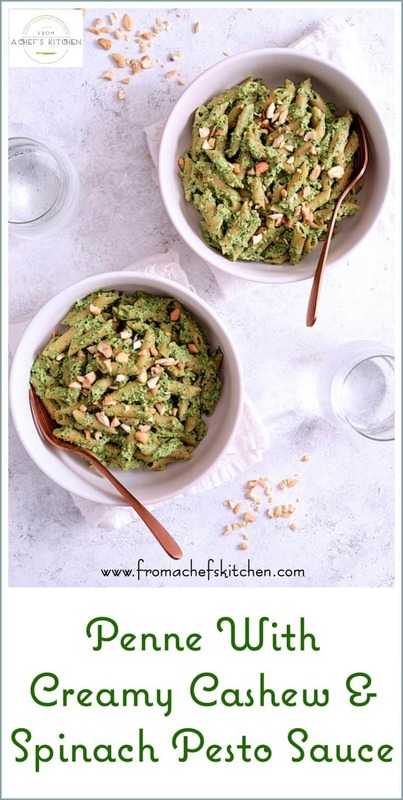 Modern Table Penne with Creamy Cashew and Spinach Pesto Sauce is an easy, delicious, nutritious plant-based dairy-free and gluten-free meal that’s perfect for a weeknight yet elegant enough for guests! I’ve got a great tip to make pesto oil-free so read on! Hey, friends! 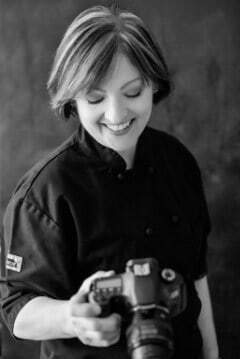 Sharing something very special I am loving and I think you’re going to love it, too! When my husband and I want pasta, we always try to make the healthiest choice. 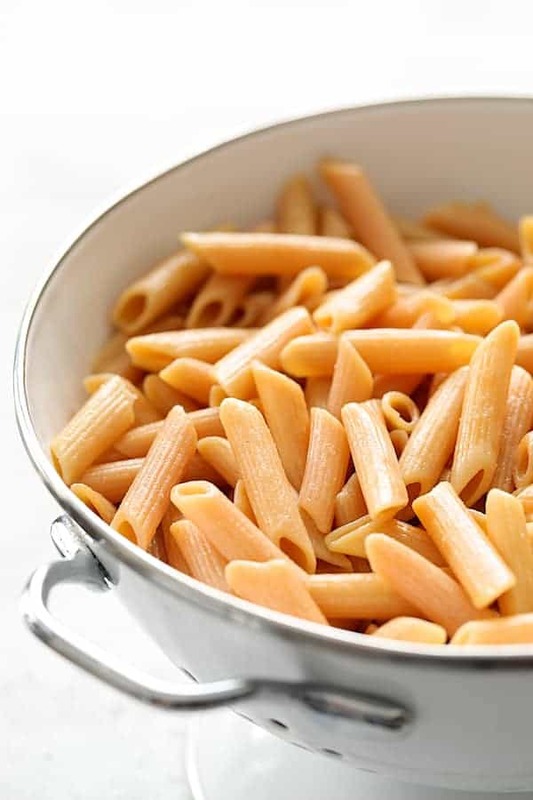 We love pasta but we don’t love all the simple carbohydrates regular pasta has. I recently discovered Modern Table Complete Protein Pasta and it’s amazing! 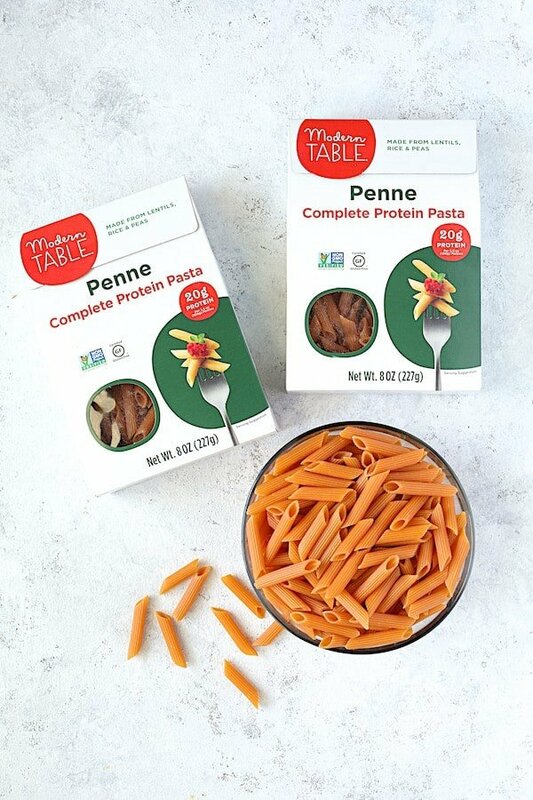 Modern Table Complete Protein Pasta has 20 grams of protein per 3.5-ounce serving! Wait. What? All Modern Table pastas are lentil-based and contain complete protein–meaning they have the 9 essential amino acids our bodies need for strong energy, good digestion and muscle health. 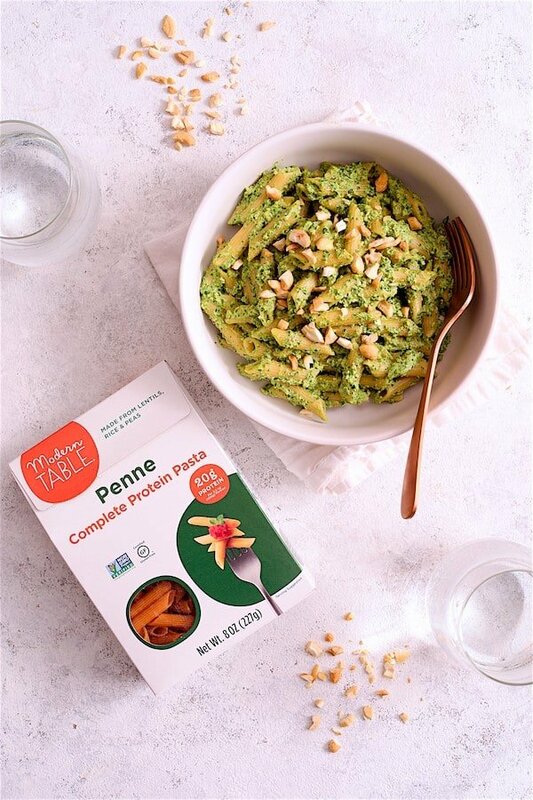 With only three plant-based ingredients, the plain pastas are vegan, non-GMO and gluten-free. In addition, each serving has 5 grams of fiber. Modern Table pastas are for those looking for a healthy lifestyle. It’s the perfect way to get more nutrition from your meals–a blend of nutrition with the texture of tradition. I was super-impressed with the texture–just like traditional pasta! I used Modern Table penne pasta for this dish, however, it’s also available in elbows, rotini and spirals. Let’s get started! 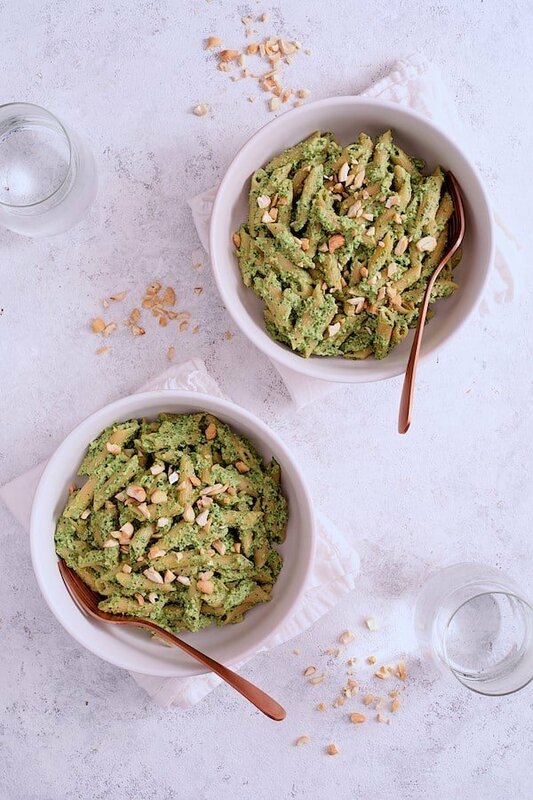 This Creamy Cashew and Spinach Pesto Sauce is completely vegan, dairy-free, gluten-free and oil-free! Start with raw or roasted cashews. Roasted cashews are easier to find and I like the extra layer of flavor the roasting provides. If using salted cashews, you may not need to add additional salt later. A quick soak in boiling hot water for 30 to 45 minutes. A soak starting with hot tap water for 2 hours. A regular soak at room temperature overnight. Reserve a little of the soaking water then drain the cashews. Place the cashews in a mini food processor or blender. Add a tablespoon or two of the soaking water then process to a thick sauce consistency, adding small amounts of water as needed. Don’t worry if it’s not 100% smooth; it will be going into the pesto and a little texture from the cashews is just fine! 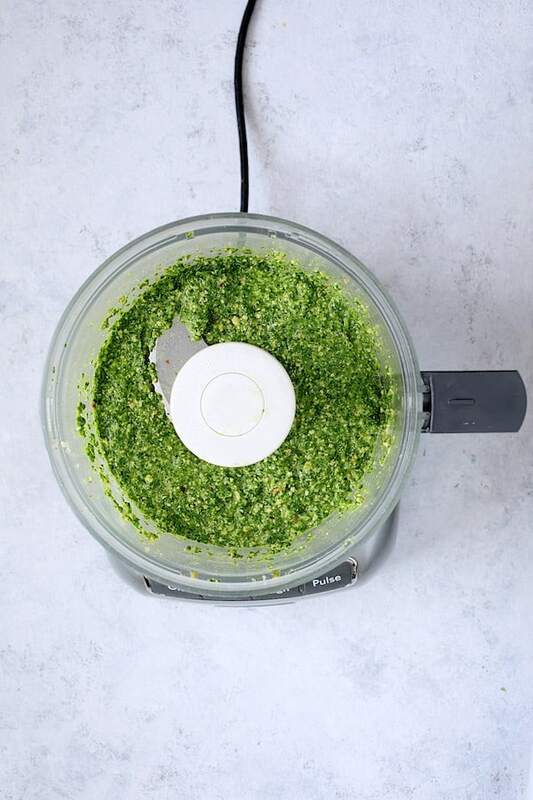 Combine the pesto ingredients in a food processor or blender: The spinach, more cashews, garlic, a little lemon juice, some crushed red pepper flakes for a little heat and here’s the oil-free tip…. 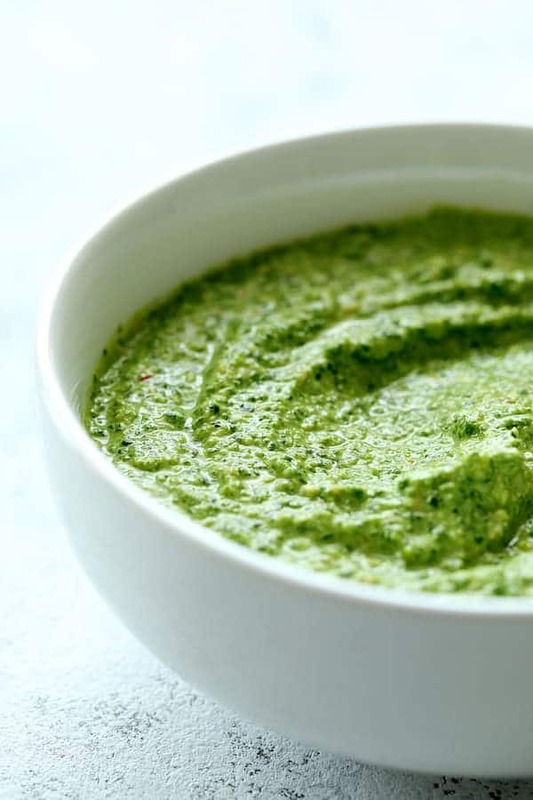 ⇒⇒⇒ To make this pesto or any pesto oil-free, substitute vegetable broth in place of the oil. Vegetable broth adds flavor without the fat and calories of oil. 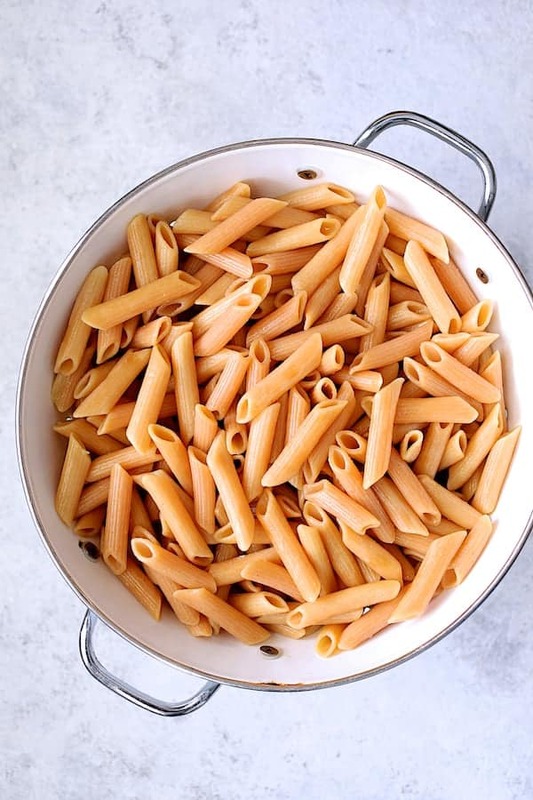 Place the penne back into the pot. 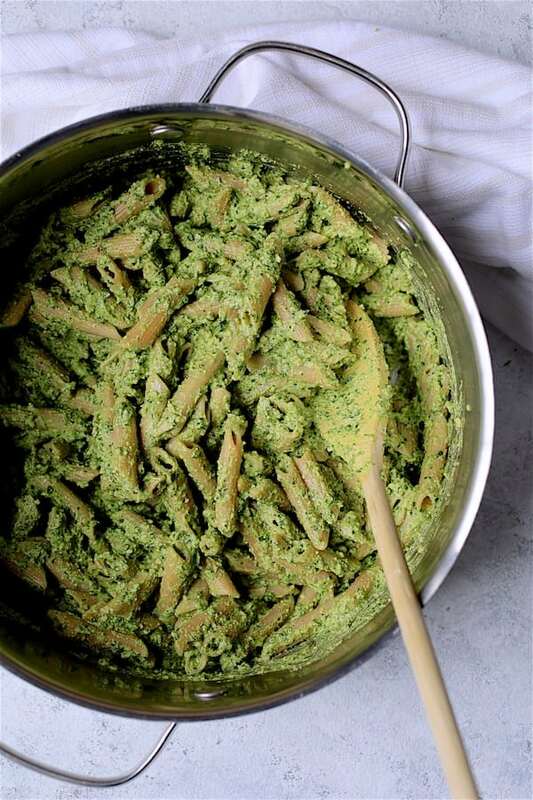 Stir the Creamy Cashew and Spinach Pesto Sauce into the hot, cooked penne. Serve! So easy, so good and so good for you! With Modern Table pastas, you don’t have to give up the good stuff because the stuff you want is good. Now you can have your pasta and eat it too! 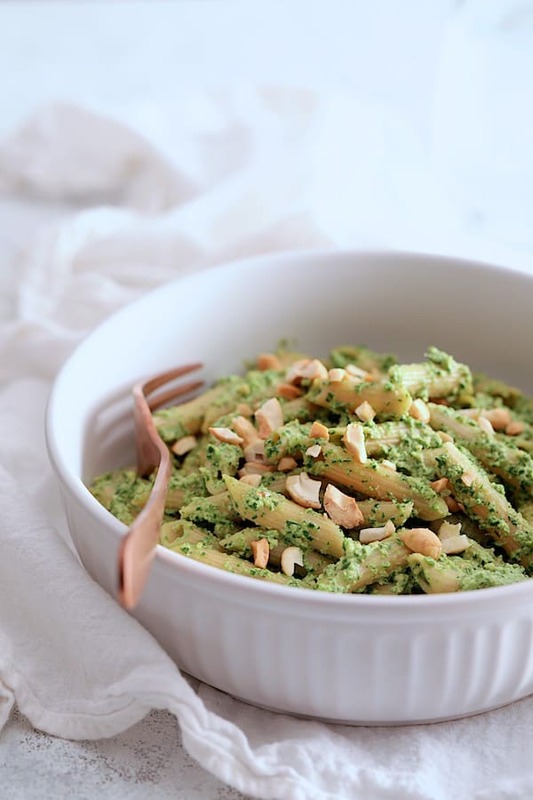 Modern Table Penne with Creamy Cashew and Spinach Pesto sauce is an easy, delicious, nutritious plant-based meal that's perfect for a weeknight yet elegant enough for guests! Plus a great tip to make pesto oil-free! Bring 3 cups of water to a boil in a small saucepan. Add 1 cup cashews, turn the heat off and let stand for 30-45 minutes. Reserve 1/2 cup of the soaking water then drain cashews. 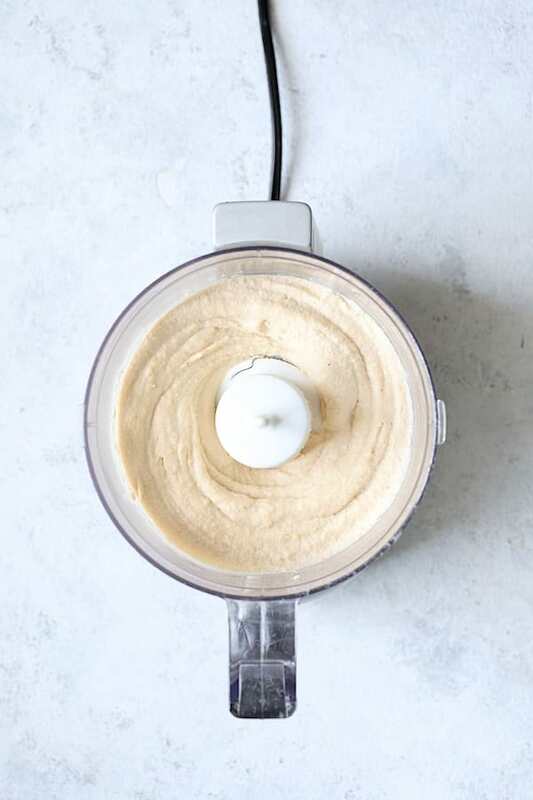 Place soaked cashews in a blender or mini food processor. Add 1-2 tablespoons of the soaking water. Puree the cashews until very smooth, adding small amounts of water as necessary until you have a creamy consistency. Transfer cashew cream to a bowl. Place 1/2 cup cashews, spinach, vegetable broth and garlic in the blender or in a food processor. Process to a paste consistency. 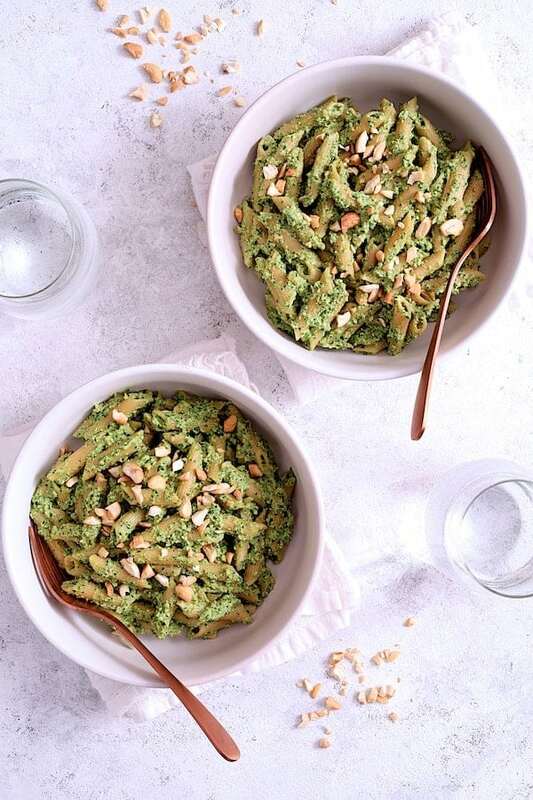 Add cashew cream to pesto and process until combined. Coarsely chop remaining 1/2 cup cashews. Meanwhile, bring 4 quarts of water to a boil in a large pot. Add salt if desired. 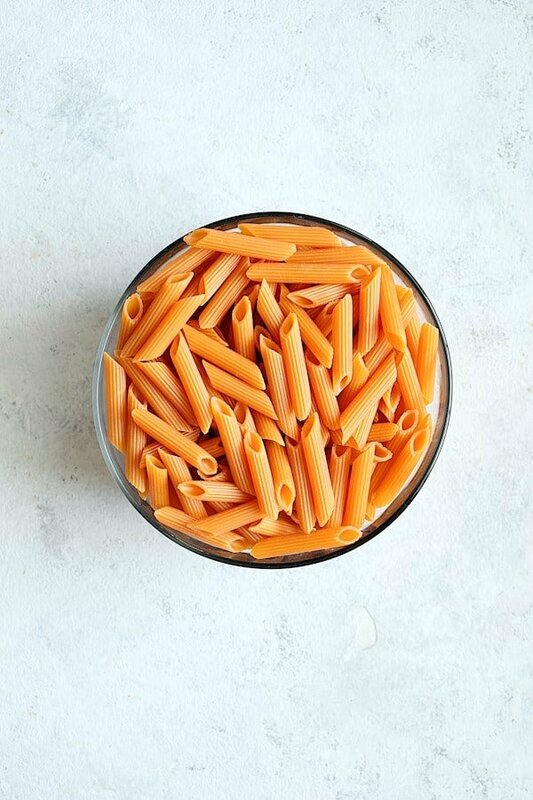 Stir in 2 boxes of Modern Table penne pasta. Reduce heat to medium-high (this minimizes foaming). Cook 11-13 minutes, stirring occasionally. Drain. Add pesto sauce and stir to coat the pasta. Serve in bowls, garnished with chopped cashews. 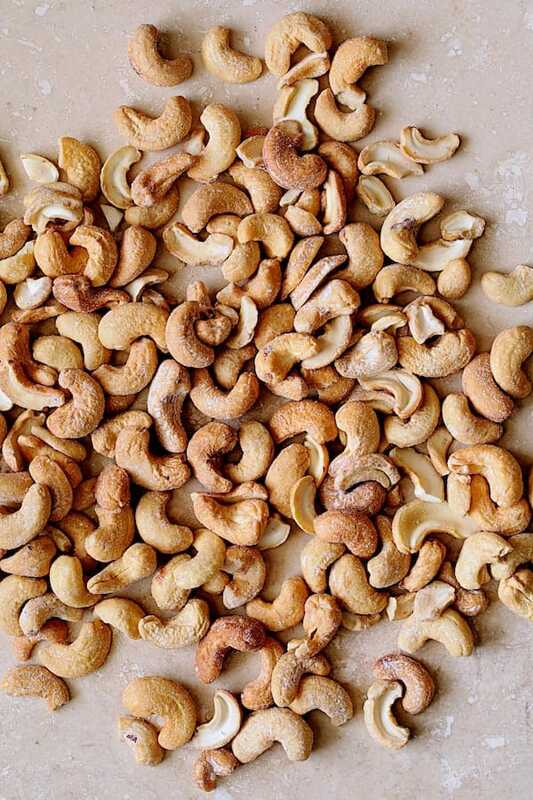 Alternately, soak cashews in hot tap water for 2 hours or in room temperature water overnight. The above information is FOR THE SAUCE ONLY. Please see the box of Modern Table Complete Protein Pasta for the nutritional information of the pasta. The nutritional information above is computer-generated and only an estimate. Please do your own research with the products you're using if you have a serious health issue or are following a specific diet.